It happens every fifth November, and it's slated to happen again this year: Gadhimai, the massive, month-long Hindu festival, is set to occur at the end of 2014, and will bring with it the single largest animal sacrifice in the world. Typically, the festival results in the slaughter of an estimated 250,000 to 300,000 animals -- mostly pigs, water buffaloes, chickens, goats and pigeons -- in honor of the power goddess for whom the ritual is named. According to some reports, the last Gadhimai sacrifice, in 2009, saw the deaths of closer to 500,000 animals. There is more to discuss about the festival than the horrifying numbers, but the numbers are an easy place to start. Each Gadhimai, the festivities begin with the slaughter of several smaller animals: in 2009, a priest started with two rats, two pigeons, one pig, one rooster and one lamb. Then, after the sacrifice officially began on November 24, 250 residents of the village Bariyapur entered an enclosure surrounded by brick walls and decapitated 10,000 buffalo calves; some say they killed 20,000 by the end of the day. That number doesn't include the thousands and thousands of other sacrifices that occur throughout the village and in the tent cities set up nearby -- the tent cities were 5 million pilgrims, mostly from India, offer their own contributions to the goddess. Despite India's ban on crossing borders with livestock, 80 percent of the pilgrims who attend Gadhimai do just that -- because, in addition to outlawing international transportation of livestock, the nearby Indian state of Bihar also has a ban on ritual sacrifice. That's not the case in neighboring Nepal, where the government not only condones animal sacrifice, but also subsidizes the practice. In 2009, the Nepali government contributed over $60,000 to Gadhimai events, after previous attempts to cut funding resulted in protests. But there were, are and will be protests surrounding Gadhimai either way. In recent years, animal welfare activists have organized efforts to stop the event, and have gone so far as to petition the Nepali president and prime minister to end Gadhimai for good. While pilgrims and participants defend the festival as a sacred tradition and key religious ritual, the bones, meat and hides leftover from the slaughter are sold off to corporate buyers -- a sign to activists that the basis for the event might be skewed. Numerous petitions against the tradition have cropped up, and whole organizations have formed to put a stop to the slaughter at Gadhimai. It's early still, but plans for this year's quinquennial festival are already in place -- and activists are already trying to stop them. Groups like AWNN (Animal Welfare Network Nepal) have been working with local officials in villages near Bariyapur to educate residents about animal welfare and mobilize them before this year's festival. Thanks to sensitizing informational workshops, AWNN estimates that upwards of 10,000 people will have been mobilized to protest Gadhimai by this November -- but it'll take more people than that to stop the sacrifice. 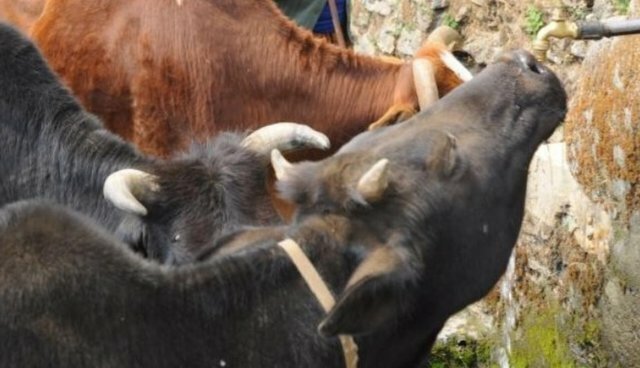 To help AWNN and others put a stop to the damaging large-scale sacrifice at Gadhimai, you can forward a letter to the Nepali department of Culture, Tourism and Aviation, as well as to the Ministry of Agricultural Development Department of Livestock Services and its Quarantine Officer. You can also contribute to the protests by tweeting with the hashtags #stopanimalsacrifice and #Gadhimai. Additionally, if you'd like to donate to the cause, you can visit AWNN's website for more information.